Last month in European Threats, I quoted Victor Hill saying “a disorderly Brexit will be that spark that sets the Eurozone tinderbox aflame.” The fire is still ready to light and, if no deal emerges before the March deadline, could certainly erupt in flames, metaphorically speaking. Many analysts doubt this, trusting some last-minute agreement will emerge because a “hard” Brexit is in no one’s interest. It makes no sense, the logic goes, therefore it won’t happen. The problem is we are dealing with politicians who may have entirely separate interests, and in any case have been known to miscalculate. If governments always did the sensible thing we would never have wars and other international calamities. Yet we do. Politicians everywhere are perfectly capable of making terrible mistakes. My friend Lord Matt Ridley, one of the world’s premier free market philosophers (of The Rationalist Optimist and the uber-important The Evolution of Everything fame) recently made the point that even a no-deal Brexit would be better (for Britain) than the current proposal. He has a great deal of faith in free markets to adjust quickly, as do many others in the UK, so that may prove important to the final decision. We will see. 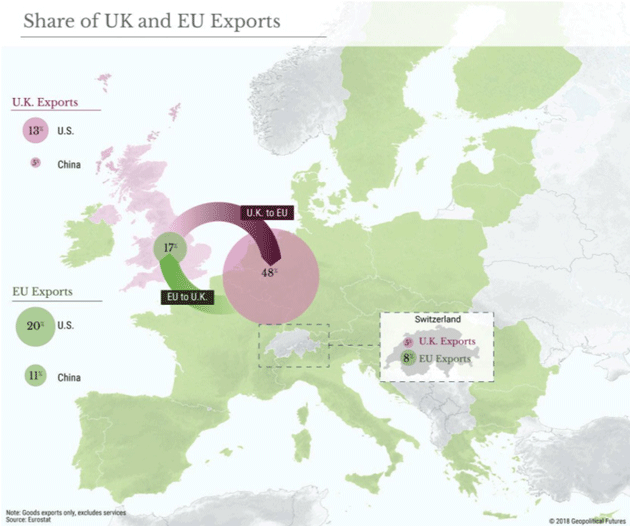 Some 48% of UK exports go to the EU, far more than it sells to the US. That means increasing trade with the US will have limited benefits, even if the US/UK sign a new free trade agreement. The EU is less dependent on the UK, though some regions and companies will surely get hurt. Two key questions will remain: What will be the UK’s future relationship with the EU, and what will be the future of the UK itself? The United Kingdom maintains a close security relationship with several European states. It’s also an important trade partner for major EU economies such as Germany and the Netherlands. Deal or no deal, those relationships will continue, and the UK will be an important ally for EU states on the periphery seeking to balance against Germany and France. Its future is a different story. Much will depend on the deal, but the same forces that compelled the United Kingdom to leave the bloc threaten its unity, too. If a Brexit deal ends up disproportionately hurting Scotland, for example, it could create renewed calls for Scottish independence. Northern Ireland is also in an unstable position. The sectarian issues that led to the Troubles are still simmering, the peace held together by the 1998 Good Friday Agreement is fragile, and the economy is under significant pressure. Businesses aren’t waiting to see how this ends. A new EY study says financial firms are in the process of moving assets worth nearly $1 trillion out of Britain to various EU domiciles. Many are moving staff as well. Look for that trend to accelerate quickly if next week’s vote in Parliament fails. As noted, US/UK trade exposure is relatively small for both countries, but some of it is important and irreplaceable. The bigger problem is intangible. We rightly call it a “special relationship” because our two countries were once united. That split was painful, too, and took a long time to heal (see the War of 1812). Whatever hurts the UK will hurt the US, too. A Brexit-sparked recession will hinder trade, force some US companies to find other partners, and aggravate our own problems. But the bigger problem is that the US will get hit on both sides. A hard Brexit will hit both the EU and UK economies, including China, and the damage from both will then spread worldwide, including to the US. For years, whenever we talked about the European economy, one country drove the discussion: Germany. Yes, the UK and France are big but Germany is the giant. If Germany sneezes, the rest of the continent catches cold. And it is sneezing hard right now. The latest GDP forecasts peg German growth at 1.5% for full-year 2019. I think that is aggressively optimistic, coming after a 0.2% contraction in Q3 2018 and only 0.5% growth the quarter before. It’s getting worse, too. Industrial orders for export dropped 3.2% in November and Germany’s exports are what keep its economy—and the Eurozone’s and the EU’s—alive. This is partly due to the same cyclical factors hitting US growth. Like the US, Germany had a good (although not spectacular) run since the last crisis and at some point it must end. Trump’s threat to slap tariffs on EU autos doesn’t help. But some of this is uniquely German, too. The euro currency effectively gave Germany a stranglehold over the zone’s smaller players who bought German exports with German loans. We saw how that worked with Greece. Now a similar dynamic is unfolding in much-larger Italy—which, for its part, has some unique problems, too. Yet with all this going on, the European Central Bank is still intent on ending its asset purchases in the coming year, even as it keeps interest rates negative. That is a formula for a wildly distorted economy, at the very least, and possibly much worse. Meanwhile, next door in France the “yellow vest” protests reveal substantial and well-organized working-class unrest. Imagine what will happen if (when) the EU economy turns seriously south, unemployment shoots even higher than it already is, governments can’t afford their safety nets, and the population can’t afford higher taxes. It could get ugly and not just in France. Remember, many EU countries are parliamentary systems whose governments can fall anytime. I admit, this is a gloomy outlook. Maybe it’s wrong. Gavekal’s Nick Andrews recently looked at these same issues and asked what could change Europe’s trajectory. 1. A favorable Brexit deal. Since the UK’s 2016 referendum, eurozone shipments to the single currency bloc’s second-biggest export market have stagnated. If the clouds clear in the coming months, with a no-deal Brexit avoided, then risk premiums will diminish, sterling will rally and eurozone exports to the UK are likely to pick up. For now, however, the outlook on this front remains highly uncertain. 2. 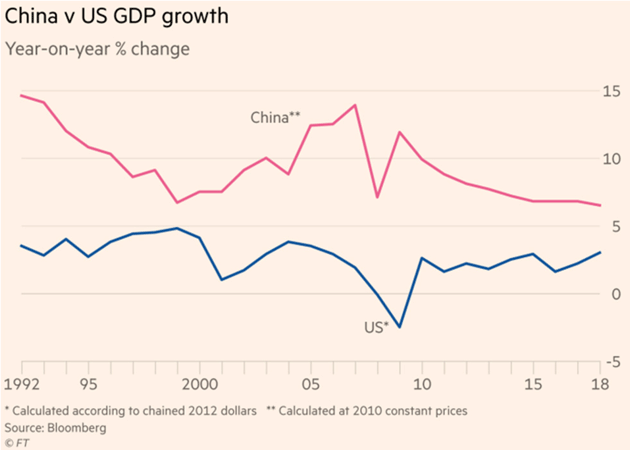 Improved US-China trade relations. A deal to avert tariff increases would remove one major uncertainty hanging over the global economy. Again, risk premiums would fall. 3. A stabilization or acceleration in Chinese growth, whether as a result of a trade deal or a domestic stimulus program. A pick-up in Chinese domestic consumer demand would benefit European companies exposed to Asia, notably luxury goods stocks. However, there is little probability of a stimulus effort on the scale of 2009’s, so the effect on Europe’s economy and markets of Chinese policy easing is likely to be muted. In short, there is little prospect of a new domestic driver of European growth emerging, and the external situation remains highly uncertain. In the absence of any clear new growth engine, the composite eurozone PMI released in the first week of January indicates that a slowdown of year-on-year GDP growth to around 1% from the ECB’s estimate of 1.9% for 2018 is possible. Nick says this very nicely, but his implication is disturbing: Europe is helpless and will continue circling the drain unless external events (over which it has little control) go its way. That is not a comfortable position to be in. If eurozone growth ends at 1% in 2018, it’s a good bet 2019 will be no better and possibly bring a true recession. What happens to German banks in that scenario? And if they go wobbly, what happens to US, Canadian, and Asian banks? And if Europe goes into recession, it will have a significant impact on the world and the US. Paying attention to Europe—and not just the Premier League—will be important in 2019. Something wicked is coming, and we may see far more yellow vests or their equivalent all over the world before this is over. I see significant potential for global recession and it will bleed over into the US market. A few unforced errors upon the part of the US central bank or government could bring recession sooner rather than later. Economics is about to get interesting. I write the final lines of this letter while in my “office” on American Airlines flying from California to Washington, DC. I get to spend Friday afternoon with my good friends Andrew Marshall, Neil Howe, and a small group talking about world events. For those who may not know, Andy Marshall was appointed by Richard Nixon in 1973 to head up what is now called the Net Assessment office of the US Defense Department, which was basically their futurist think tank. He was then reappointed by every president and secretary of defense until he retired three years ago at the age of 94. Even now, surprisingly to me, Andy “adopted” me and let me into his world and his thinking. The weeks I have spent at the Naval War College working on developing contingency planning concepts for the DoD have been some of the most stimulating in my life. Andy would assemble out-of-the-box thinkers from different backgrounds, then we went at it for 12–14 hours a day for over a week. He held those events for decades, which informed his advice to various administrations and leaders. To say he has been at the center of the development of US strategic policy is an understatement. At 97, he is as intellectually strong as ever. Is it a privilege and honor to be able to spend some time with him. Saturday I fly back to Dorado, Puerto Rico (where we now live) and meet Shane who is coming in from Dallas. I am looking forward to being back home, although Steve Blumenthal of CMG is trying to drag me back to Tampa Bay for an evening in the third week of January. Let me know if you’re in the area and would like to meet. Then at the end of the month I will be at the Tiger 21 conference in Boca Raton. I have been with Pat Cox for the last two days in San Francisco listening to presentations from biotech companies, particularly antiaging and age reversal technologies. It is a remarkable antidote to my assessment of the global economy and politics. We are on the cusp of new biotechnology that could eclipse the global, social, and economic impact of all previous technological revolutions. I think by the mid-2030s we will look back and just marvel. I must confess there are times when I feel a bit of mental dizziness. The profound implications and changes technology will bring are simply staggering. And then I try to wrap my head around how the world deals with the growing political, social, and economic “fingers of instability” and I am just stunned. Perhaps you have the same sense of disconnect? Maybe that combination is why I tend to be of the “Muddle Through” persuasion. And with that confession of confusion, I will hit the send button. I wish you a great week and perhaps a little time in the warmth and sunshine of Puerto Rico will help bring a little clarity to my mind.